For answers to some of the questions that have been left in the comments see this follow-up post. Ed. note: Earlier this week I went for a walk in the Conservatory courtyard and spotted a beautiful Mandevilla vine growing vigorously in a container. I tweeted a picture of it, and almost immediately we got a reply from Twitter-user Jacqueline Lewis asking what is the best method for over-wintering this beautiful vine. It seemed like a really good question, so I put it to Gardener for Public Education, Sonia Uyterhoeven. Her answer is below. ~ A.R. 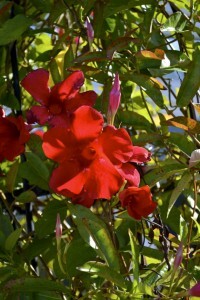 Mandevilla (Mandevilla splendens) is native to Brazil. It has glossy leaves and striking trumpet shaped flowers. It is generally grown as a vine but can also be pruned to maintain a shrub-like upright shape. 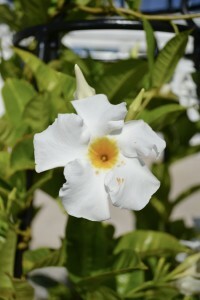 Mandevilla (Mandevilla x amabilis) is a hybrid that grows to be a large vine reaching 8 to 10 feet tall. They are generally grown on trellis. Both the species and the cultivated variety love light and good drainage. Wait until it starts to dry out before you water. Fertilize your mandevilla every other week with a liquid fertilizer when it is actively growing. Unlike many tropical plants, mandevilla does not like to be pot bound so give it room to grow. Mandevilla are not hardy in our area, USDA Zone 6, so you have two options if you would like to over-winter your vine. The first option is to bring it into your home. If you have enough space and a bright sunny window then move the container inside once the weather starts to cool down. It is always a good idea to prune it back before you transfer it into your home. Cut the vine back so that it is a comfortable size for your home–by half is fine–less or more will also work. It will grow slowly during the winter months. You do not need to encourage growth at this time of year by fertilizing the plant, just water it when it begins to dry out. Sometime in February, give the plant another good pruning and begin to fertilize it once a month. Mandevilla flowers on new growth. By pruning and fertilizing the plant, you are working to give it an early start so that when you place it outside in May or June it will take off and soon be covered with flowers. If you are growing a mandevilla in your home, it is a good idea to lower your thermostat to somewhere in the 60s or low 70s, otherwise it may get too dry. The second option for over-winter your mandevilla is to allow it go dormant. Keep the vine outside until it gets nice and cool and then move it into a cool garage or basement that maintains a winter temperature above freezing, around 50?F is ideal. In this scenario you should cut the plant back hard, to about 12 inches. Occasionally give it water so that it doesn’t dry out, but essentially leave it alone. Bring it inside when spring is just around the corner and let it start to grow. Then set it outside and enjoy this beautiful plant throughout the summer. Good luck! Thanks for the information, but pruning seems to present one problem - milky sap dripping from cut ends. How do I deal with that or can I just ignore it? Also how do I propagate the plant? Thank you (both) for the prompt reply. Happy New Year. Ian. Hi I was wondering if i can put the mandevillas in a greenhouse because i have 8 of them and they are very big in pot size. If i am removing it from the earth to a container, what size container is a good size? Choose a container that is big enough so it won't get root bound. The Mandevilla does NOT like to be cramped and needs plenty of "leg room". How often is occasionally for dormant watering? I am losing leaves fast. What should I do? Last year I tried to divide at the root; many "pinky finger" type corms; tried to grow some of them but they rotted. No one ever talks about dividing from root - wondering why? My mandevilla got touched by some frost here in GA. They look pretty bad. Can they be salvaged or should I look to getting some new ones in the spring? I took my plant inside and pruned it up and it started growing real good. after about a month,the leafs started falling off and a white fungus started getting all over it. What is the fungus and will it hurt the plant? I planted my Alice Dupont Mandevilla in the ground. I live in ohio and I would like to winter it in the ground. What can be done to ensure it's survival? I have little yellow powder on the stems, not on the leaves. How should I treat this? our mandevilla we brought inside in fall . pruned back to 12-15 in. was dorment 2 months then budded out. now leaves are turning black on the edges and curling up and falling off. what is wrong.. I am putting my Mandavilla in the basement with a grow light that is regulated with a timer.. Watering once per week . Have cut it back to around 50% of its Mid summer size... Treated for insects... Fingers crossed. It is end of January and my mandevilla desperately needs transplanting, as I looked closer it is covered in white! Almost like foam on nodules, tons of specks under leaves, I don't know what to do. It's still way to cold to put it outside, should I let it go and just buy a new one. It was doing great all winter then in one week started dying off, I thought it was just transplanting. Can you help please? Please notify me with answer back thank you. I live in northern New Jersey, and I have to overwinter all my plants indoors. I have three tropical hibiscus plants, and a white mandevilla, all in pots, and all in my south facing windows. The mandevilla is now producing a lot of flowers which is a nice surprise, given this very cold winter. I feed it occasionally, and keep the soil a little more on the dry side between waterings. I have been trimming off the long and rapid growing shoots, and keep the plant pruned, so it stays somewhat compact indoors. My hibiscus have each had a bloom or two, but are a bit more of a challenge keeping the watering schedule to their liking. They don't like wet feet, but they don't like to be dry either. I have just pruned them, in anticipation of a nice start in growth as soon as the weather warms up. I also have two smallish Improved Meyer Lemon trees in pots. They had a few lemons on them when I purchased them at the end of summer. One tree is getting a few new leaves. This is the first winter I have been successful overwintering citrus trees indoors. In past years I either overwatered them, or underwatered, and they did not survive. Fortunately, this time I am doing something right. I will soon start feeding them an organic citrus food, as soon as I find some. I am really looking forward to the scent of lemon blossoms, which is heavenly. I used to live in southern California, and there were citrus groves in many areas. I did not cut my mandevilla back when I brought it in last fall and now have tons of rambling leafless vines. I am putting it back out on my zone 6 deck on warm days, but do I trim or cut back the vines now or let it go? I don't want to ruin any flower production. I have wintered a mandevilla two winters now. Last year had some white mites so I stuck it in the shower and then sprayed it with indoor plant bug spray. It needed a second spray the next week. It survived and is now flowering and about four feet tall. Wish I had known about fertilizing it might have flowered sooner. It's August in New Hampshire. Also have a grouping of five coffee plants in one pot. Beautiful green leaves like the mandevilla. The coffee plants are five years old and now I am getting beans. Fun stuff. Have had my plant for 3 years live in the berkshires. I brought it in each year and placed in sunny window. I let it die back at its own pace watering when I thought of it. This year it is about 6' diameter and 5' high. Moved so this year will try basement in new house and hope it works out. The only fertilizer I have ever used on it is bloom booster. Love my plant! Hope it survives. This is just what I wanted to know. Thank you. It's so nice I want to save it for next spring. I am in zone 9a can I over winter my vine outside if I mulch heavy around the roots. It is growing up a wall & there is a brick wall on the other side of vine. Like in a V shape. We are overwintering our Mandevilla in the basement as dormant. Cool dark and the vine is growing rapidly. It was about 10 ft tall when we brought in in. We are zone 5. We cut it down all the way and it is growing rapidly with,pale green leaves. What do we do. do i cut back the vines so the energy goes right to the body of the plant? I live in zone 9 and winters are harsh. The Mandevilla, Alice du Pont, caught my eye at a local farmer's market and I just had to have it. It is in a rather small pot so I will put in a larger one shortly. What do you treat the plant with if it gets bugs on it? It had been treated when I purchased it. This is a first for me so I hope I can be successful overwintering it. Is it poisonous to cats if the chew on the leaves? Can you plant in ground and leave in ground over winter. I'm in zone 8? I cut back my mandavelilia last fall and kept it in my sun room. I put it outdoors when the weather was warm enough. However, it has yet to bloom although it continues to grow and sends up new shoots. How do I get it to bloom? Thank you for any help. Emilio. This may seem like a silly question, but how do you tell if your Mandevilla is dormant or dead! The last 2 winters I brought smallish plants into the basement where they thrived under grow lights and 60 - 70 degree temps . In March, they started to drop leaves and where bare before I could bring them outside - zone 6. They ended up in the trash! Had my mandevilla outside all summer and did not bloom at all....Lots of foliage....its in a container so I will be bringing it in soon....what can I do to ensure flowers next year? I live in zone 6....any help is greatly appreciated. Thank you. There is a bounty of great questions here which seem to be quite similar to what I too would like to know. BUT.....it's EXTREMELY frustrating that hardly any of these questions are being answered. This website is at the top of the google page and it puzzles me why this is so..... You people DO NOT do your homework? my mandevilla is now in the garage. i hope it lives. I never saw this plant until last mom's day when a friend gave me one. it grew on my patio all summer and gave me beautiful blossoms and grew at least 7 feet tall. I really love it and I'm praying that it lives thru the winter. I live in SW Pa.
We moved to a new house a year ago. The previous owner left a Mandeville potted on the porch. It was October, so we brought it inside. It was messy because it lost a lot of leaves while inside. By spring we cut it back & put it on the porch. It was very happy all summer, playing host to multitudes if hummingbirds. This fall finds it inside again, in a different spot with southern afternoon sun instead of constant northern exposure. It is happily blooming. We will cut it back after it stops blooming, then it will go back outside in late April. A great plant, worthy of keeping alive during zone 5.5 winters. What is the best fungicides to use on Mandevilla when bringing it inside for the winter. Might have a whitefly problem. leaves are falling and has little white things all over the leaves what can I do? I brought my dipladenia inside when the temperatures started dropping. I only trimmed back the vines growing past the trellis, but kept the trellis in the pot. We have lost a lot of leaves inside but we have tons of new growth like tendrils. Now the leaves are starting to dry up and look dead. We water it as it feels dry, usually once a week. What else can we do? Do I need to trim it back a little more?